Melbourne turned on a warm and windy day which is not uncommon in early October. While it is not the favourite for those competing in the marathon we don’t sign up for endurance sports because they are easy. On his marathon debut Scott Morrison put down a strong run to come home in 3hrs 06mins. As everyone does in their first marathon he will have learnt a great deal and sit down with his coach Mon to aim for that elusive sub 3hrs. Ben Hughes is no stranger to a marathon and while his gradual build back into training wouldn’t have him in top marathon shape (longest run being 90mins) he showed there was plenty of residual strength left in the old legs knocking out and 3hr 36min run. Not to mention Ben worked the night shift at his job until 4am before the marathon and walked to the start line from work. Getting it done no matter what. Kathy Delos Santos had a personal best run over the half marathon distance taking off 6mins from her previous best. A great performance which showed that the work she has been doing over winter certainly has paid off. Great to see the familiar faces of Stephen Hempel and Dickie Gazelle running on Sunday. The marathon was Stephens 11th Melbourne marathon. It could be questioned that the timing of an Australian Championship event on such a busy weekend sporting wise isn’t ideal. Nonetheless 4 of the MEC crew headed to Richmond Blvd for the run/ride/run format. Martin Sprong had a last hit out ahead of his main race next week at Yarrawonga. He had a good day feeling the effects of the taper starting, but the effort was still being put in. He came away with 4th in his age group. Leanne Keating made the trek to the big smoke and it paid off. In big training for her next event in December she had enough in the legs to run her best 5k in a duathlon to date and finished 2nd in her age group. 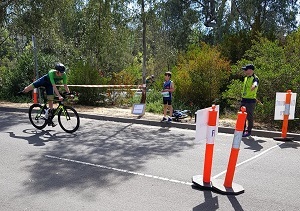 Simon Miller and Adrian Polidano raced the 40-44 age group. Simon is coming into form ahead of his final main race for the year in Shepp next month and had a strong day finishing 6th. Adrian did well to steer home the ship after a rough few weeks with a virus. As always no fuss or excuses and he got the job done coming home in 8th place. 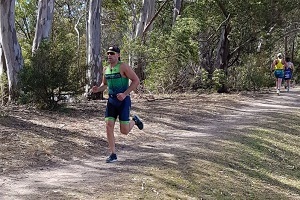 A special mention to Samantha Doust who while training for her first Rottnest Island solo crossing next year took on her first ever triathlon on the weekend at her local event in Foster. Who knows, post Rotto we may see Sam lining up for more of the swim/bike/run. When I first started training, I couldn't even swim more than 25m, the last time I rode a bicycle was probably 6-7 years ago and I’ve never run a marathon before. But I DID IT. I crossed that IRONMAN finish line. And I was only able to do it because of Michael. We are here to help you develop your performance as an endurace athlete.